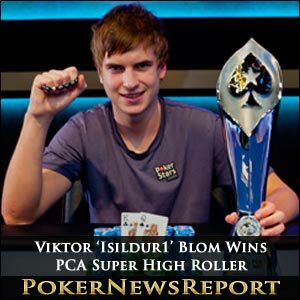 Online poker specialist Viktor ‘Isildur1’ Blom has finally made his mark on the live poker scene with victory in the $100,000 buy-in PokerStars Caribbean Adventure Super High Roller event. The sensational Swede is most definitely a star at the virtual felt, but had struggled to transfer his obvious skills to live tournaments – until the weekend, that is, after he saw off 29 other entrants to take the title, a huge trophy, a Shamballa bracelet valued at more than $20,000 and the top prize of $1,254,400 at the Paradise Island’s Atlantis Resort and Casino. It took three days for the Team PokerStars Pro to emerge victorious after he outlasted the eight-handed final table, with his heads-up battle against American Daniel Shak being the easiest knockout for the 21-year-old champion. With another American, Galen Hall, out in third place for $470,400, Viktor Blom and Daniel Shak began their heads-up clash with the Swede well on top. After a short period of play, the final hand of the event witnessed Pennsylvania’s Shak miss out on a combination draw with just one card remaining. Shak’s A♥ 5♥ lost out to the K♣ Q♠ of Blom on a board that showed 9♦ 7♣ 6♥ Q♥ 4♠, leaving the American with $846,700 as runner-up. Blom, meanwhile, had at long last collected his debut major live tournament crown. The final table began with every player knowing that just the top five were going to be paid, so American Scott Seiver, Canadian Mike ‘Timex’ McDonald, and Costa Rican Humberto Brenes ended up as the unfortunate trio to leave without cashing. The final day’s short stack, Brenes – who finished in fifth place at last year’s Super High Roller – took eighth spot after only a couple of minutes of play in the final session. He three-bet all-in with A♦ 8♥, but faced the J♦ J♥ of Hall. A board of K♥ 9♦ 4♥ 6♦ 8♣ gave the Florida-based Brenes no assistance and he was out. Seventh place went to Ontario’s McDonald, who had started the final table as the second shortest stack. 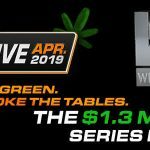 McDonald – who had won $782,410 back in September for winning the $20,000 No-Limit Hold’em Eight-Handed Epic Poker League (EPL) main event 2 in Las Vegas – decided to make his stand while holding K♠ J♣. McDonald four-bet all-in with his hole cards, only to be dominated by Blom’s A♦ J♠. The flop of 9♦ K♣ 6♥ gave McDonald top pair, but the A♥ on the river sealed his fate as Blom added to his ever-growing chip stack. Now down to just six players, the railbirds and players probably expected a long, drawn out bubble – only for Seiver to be eliminated in sixth place in under 30 minutes as he missed out on $250,900. Vegas-based Seiver held less than 20 big blinds when he moved all-in with J♦ J♠. Unfortunately, chip leader Hall had K♣ K♥ and quickly called. The board revealed A♣ 8♣ 7♦ 4♥ 6♣ and Seiver was out as the unlucky bubble boy. Incredibly, three of last five competitors were Team PokerStars Pro members, but one of those trio, Daniel Negreanu, was next to hit the rail in fifth place. The Canadian superstar had struggled to find any good starting hands as the final table progressed, so – with under 30 big blinds – he shoved all-in while holding A♠ K♣. Daniel Negreanu wouldn’t have been too disappointed to see the 8♠ 8♣ of Blom, but received no help from a Q♦ Q♠ 7♠ flop. 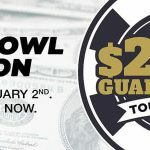 The turn and river cards also changed nothing and the 37-year-old four-time World Series of Poker (WSOP) bracelet winner was gone in fifth place for $250,900. A second Canadian Team PokerStars Pro, Jonathan Duhamel, hit the rail in fourth place just minutes later. The Quebec native went heads-up with Blom on a flop that showed J♥ 7♣ 5♥. Now all-in, Duhamel showed J♣ 6♣ to be ahead against the Swede’s A♥ Q♥, although Blom still had enough outs to make the 2010 WSOP main event champion nervous. He was right to be concerned as the 7♥ arrived on the turn to give Blom an ace-high flush. Duhamel needed a seven or jack to stay alive, but the K♦ river ended his tournament, although he did leave with a rather handy $313,600 for fourth place. Blom now had the chip lead, but was forced to battle for several hours before play became two-handed. The Swede slowly but surely began to take control as he chipped away at the stack of 2011 PCA main event champion Hall. Now down to approximately 25 big blinds, San Francisco’s Hall moved all-in with pocket nines, only for Blom to swiftly call with A♥ A♣. The flop, turn and river gave the American no help and that was Hall out in third place for $470,400, while Blom took over as chip leader. Then came that quick heads-up battle between Blom and Shak that left the 2010 Aussie Millions AUD$100,000 No-Limit Hold’em Challenge winner with $846,700 for his runner-up spot.